By Anne HornadayA draggy reboot of the franchise Western that started as a radio series before it became a movie serial and then a hit TV show, this mishmash of styles, genres and tonal shifts makes for a dizzying pastiche best described in terms of the many movies it references throughout its nearly two-and-a-half-hour running time, from Little Big Man, Buster Keaton’s The General and the Monument Valley-set canon of John Ford to Dead Man, Rango and Pirates of the Caribbean. Those last three, of course, starred Depp himself. And it turns out that The Lone Ranger may best be understood and appreciated as one long, baggy homage to Depp, who addresses the myriad personae that have made him the world’s biggest movie star, especially the tattooed, bejeweled bohemian primitive that defines his off-screen look as well as the punched-up version when he plays Jack Sparrow. By Ilan Preskovsky[T]hen there is the Tonto problem. The film has a number of notable actors providing solid, if undistinguished, support throughout but the film's main "actor in a supporting role" is obviously Captain Jack Sparrow. 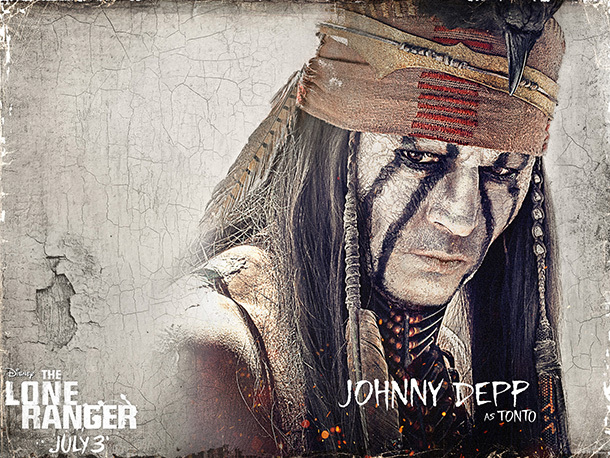 Tonto, you see, isn't played by the amazingly versatile Johnny Depp who, over his three decades in the business has amassed at least a dozen truly spectacular performances, which have in turn established him as one of the very finest actors of his generation. By Kevin GoverMr. Depp chose to have his Tonto speak in a rather solemn baritone that is too reminiscent of Tonto as played by Jay Silverheels in the television series. Though Mr. Depp’s Tonto engages in complex dialogue at times, he inexplicably reverts to Pidgin English at other times. It was unnecessary and rather annoying. By Chris EyreJohnny Depp's "Tonto" resembles nothing that is Native American in reality, not his talk, not his crow on his head, not his face paint or his Potawatomi language "Kemosabe," spoken by a fictional Comanche character. Depp's Tonto is an entertaining farce. It's an idea audiences world-wide own through Hollywood invention and appropriation. The Lone Ranger's storyline, its characters and its ideas are not based in historical fact or related to Native America or its contemporary progressive people. Period.In 'Lone Ranger' Times, There Were No Female Indians. Wait, What? By Nancy Marie MithloIf you want to move the dialogue on race forward, even and especially in the entertainment industry, you’ve got to include women–behind the scenes and on camera. For all of his apparent good will to erase stereotypes, Mr. Depp is not the individual who can change centuries of bias, hate and discrimination. In fact, no one man can accomplish this, but I’m pretty confident a Native woman could. Why? Because the male warrior in conflict with Western civilization simply supports the values he apparently challenges. But that’s another article.Comment: Oops! Critics are blue-faced and Disney is red-faced because Depp is white-faced in The Lone Ranger. Maybe Johnny Depp misheard Disney. When they said they wanted another Sparrow, he thought they meant a bird on his head. For more on Johnny Depp and Tonto, see Ilsa in a Bird Hat, Depp Justifies Tonto's Stereotypes, and Geronimo in a Crow Headdress?